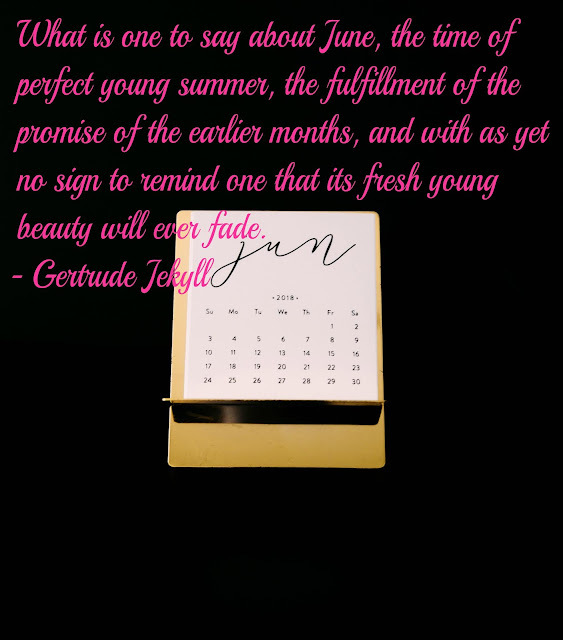 What is one to say about June? It is definitely an eventful first half of 2018. 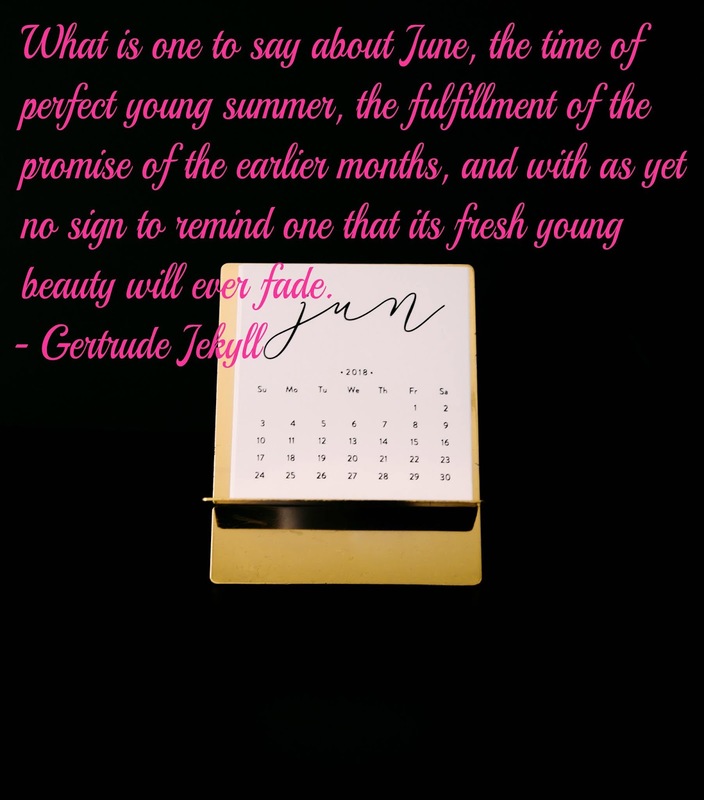 Just in the month of June alone, we have witnessed several significant events such as the kicking off of the World Cup, the historical Trump-Kim summit that took place in Singapore, the raising of short-term interest rate by the Federal Reserve to 2%, as well as the recent escalation of global trade tensions by US, with tariff threats against China, Canada and Mexico and the European Union. Back to the local market, the STI appeared to be experiencing a roll-coaster ride in the 2nd quarter. It has closed at 3430.76 at the start of April, reached a 10-years high of 3641.65 in May and ended at 3268.70 in June, recording a drop of 4.72% for the quarter. On the other hand, the SGX S-REIT 20 Index has been inching lower from 1246.74 in April to 1193.918 in June, with a decline of 4.24%. I have recently set up a Facebook Page for the blog. This is to provide greater convenience and to better facilitate the notification for any new post that is being updated here. As an avid reader to other financial blogs myself, I would usually check Facebook for any new posts as compared to my mailbox. I have applied for the IPO for Hyphens Pharma in May and was issued a small allotment. 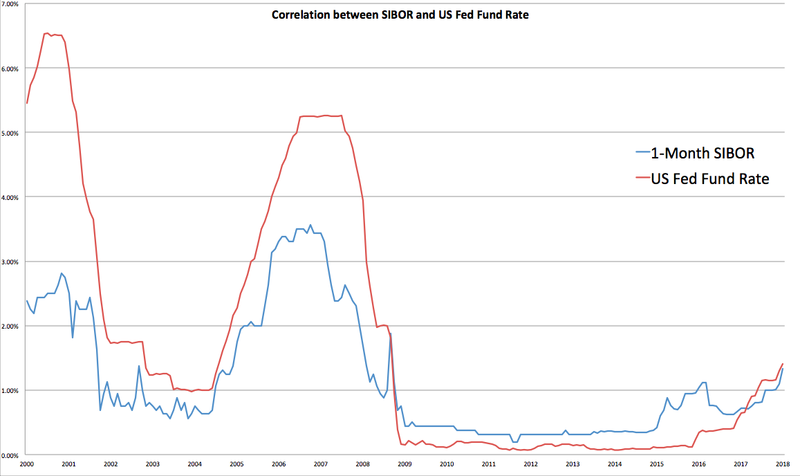 However, due to the market downturn, the number has since turned red. 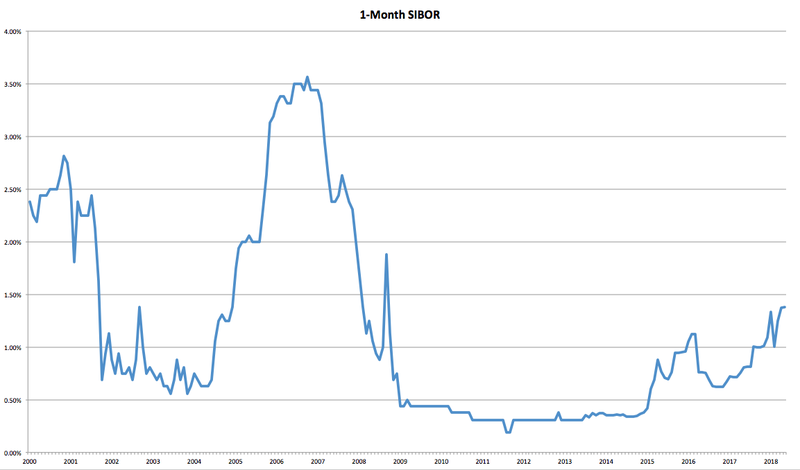 With the market volatility in mind, I will be monitoring the progress of this growth stock. Earlier in June, I have recently initiated a position in Netlink NBN Trust which I have shared my thoughts on this week. With the recent enthusiasm in the Temasek-linked Astrea IV's A-1 Bonds, I have also subscribed to a small position in June and have intended to hold it till maturity. Taking into account the current weakness in the share price of Starhill Global, I have brought down my average price towards the end of Jun. I have elaborated in this post. 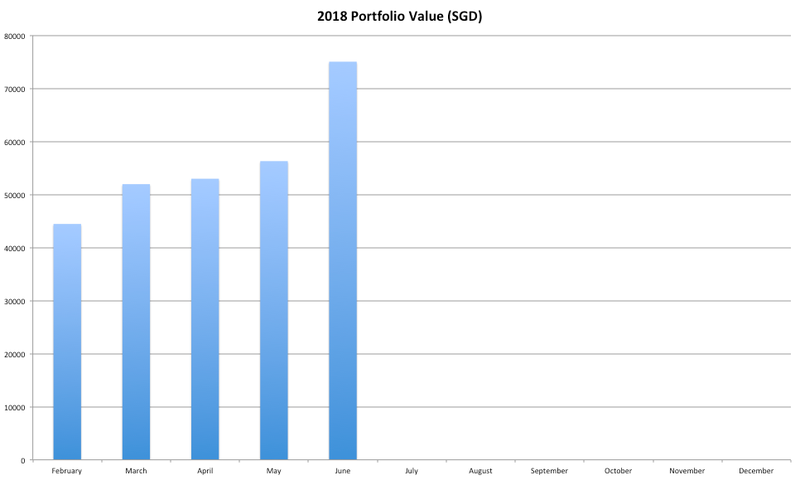 My portfolio value has increased sharply in June, mainly due to the injection of fund in view of the recent market downturn. As of 30 June, it has a total value of approximately $75,000, with just a quarter more to the $100,000 mark. Given the current sizable value, I should be looking to improve on my portfolio allocation, as well as to review and consolidate some of the holdings. 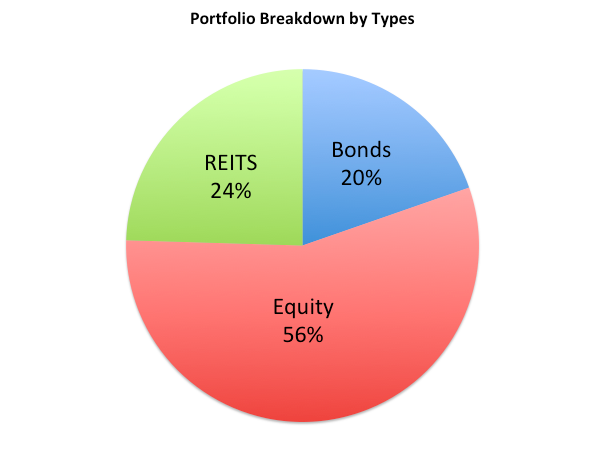 Breaking down the portfolio by types, it consists of 20% Bonds, 24% REITS and 56% Equity. Personally, I think it is a rather balanced portfolio. However, I should think that I can afford to take on greater risk as I still have a long investment horizon ahead and there is still an inflow of fund from my active income. 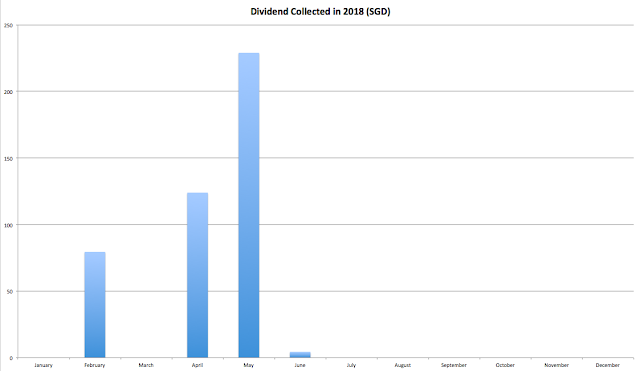 For the 2nd quarter, I have been collecting dividends mainly in the months of April and May. The dividends derived from the portfolio might seem relatively meagre as most of the portfolio value comes from recent fund injection this year. Additionally, a portion of it is invested in long-term growth stocks which generally have lower dividend yields. I have since been looking to increase my exposure in the dividend segment such as REITs, especially with the recent sell-down impacted by interest rate increment. I have also opted for Raffles Medical scrip dividend in June. 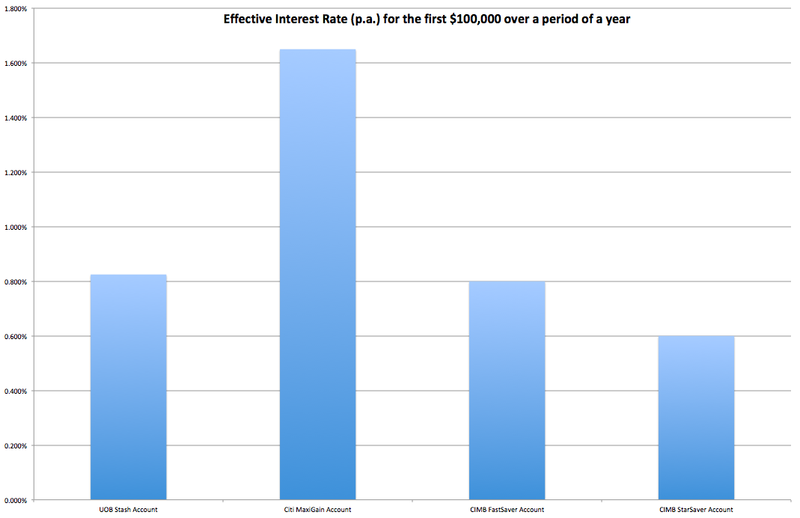 I have recently initiated a small position in Netlink NBN Trust ("Netlink") at an average price of $0.769 in June. At this buying price, it is trading at approximately 5.6% discount to its adjusted NAV/unit of $0.8146. Not a significant margin to its NAV I must say but there are other areas of consideration to justify my purchase price. The Netlink NBN Trust is a business trust that owns 100% of the units in Netlink Trust ("Netlink"), which builds, manages and operates the fibre network infrastructure in Singapore. Netlink, formerly OpenNet, supplies wholesale fibre connection services to the retail service providers ("RSP") such as Singtel, Starhub, M1, MyRepublic, SuperInternet and ViewQwest. The extensive network can be viewed as the foundation for the deliverance of islandwide end-user fibre connections for broadband and Internet-protocol TV in residential homes and non-residential premises. To have a clearer overview of its business, let's examine the 3 largest areas in which Netlink derives its revenue from. 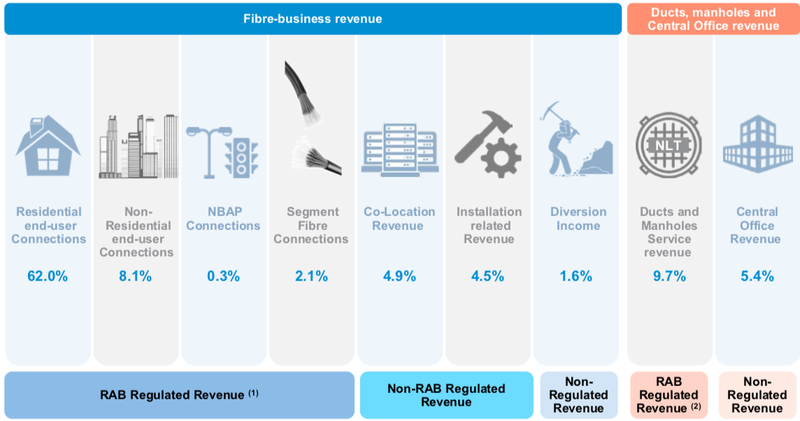 As Netlink monopolises the provision of fibre connections for residential premises in Singapore, it should come as no surprise that the majority of Netlink's revenue (62%) is earned from the residential end-user connections. This comprises of a "one-off" installation charge upon the initial connection and a recurring monthly connection charge from the RSP for each residential end-user connection. Therefore, even if consumers switch to a different RSP for their fibre broadband plans, they will still be accessing the network deployed by Netlink. In fact, the competition among RSP might push down the prices which could possibly entice more people to switch to/sign up for fibre broadband. The following sizable revenue segment (9.7%) is contributed by the duct and manholes services, which form parts of the passive fibre network infrastructure. This is made up of revenues received from RSP for accessing its ducts and manholes for their business needs. The next considerable revenue segment (8.1%) comes from the non-residential end-user connection. Unlike the field of residential connection, Netlink does not have a monopolistic advantage in this domain. It faces competition from the other RSP which have their own fibre networks mainly in the central business district and other large business parks and data centres. As such, Netlink's strategy is to target the growing small and medium sized enterprise businesses located outside of these areas. Based on the figures by MDA, it has a market share of approximately 33.79% of the non-residential wired broadband subscription market as of 31 Mar 2018. Another noteworthy division is the Non-Building Address Point ("NBAP") connections. These refer to connections of location that does not have a physical address or assigned postal code such as traffic lights, bus stops, lamp posts, ERP gantries, void decks and carparks. The application of NBAP can range from wireless network base stations for telco operators to cameras and sensors. Even though the provision of NBAP services remains in its early stage and only forms a mere 0.3% of Netlink's revenue composition, it offers the most exciting growth potential as projected in the prospectus. It will largely be driven by Singapore's Smart Nation Programme initiatives which require the deployment of a network of sensors and monitoring equipment to support applications such as autonomous vehicles and high-definition surveillance cameras. Now that we have a clear summary of Netlink's underlying business, we can discuss about the various drivers of growth for some of the key divisions. Migration from slower technologies like Asymmetric Digital Subscriber Line (ADSL) and Hybrid Fiber-Coaxial (HFC) to fibre-based networks: This can be supported by the increasing competition among RSP which allows broadband plans to be more affordable. Additionally, various RSP are working towards retiring the ageing technologies as it might not be commercially viable for them to maintain it. Singtel has shut down its copper-based ADSL network in April this year and has offered fibre packages to the affected 47,000 customers. Starhub has also recently announced that they have ceased further rollout of its HFC network to new residential and commercial buildings. 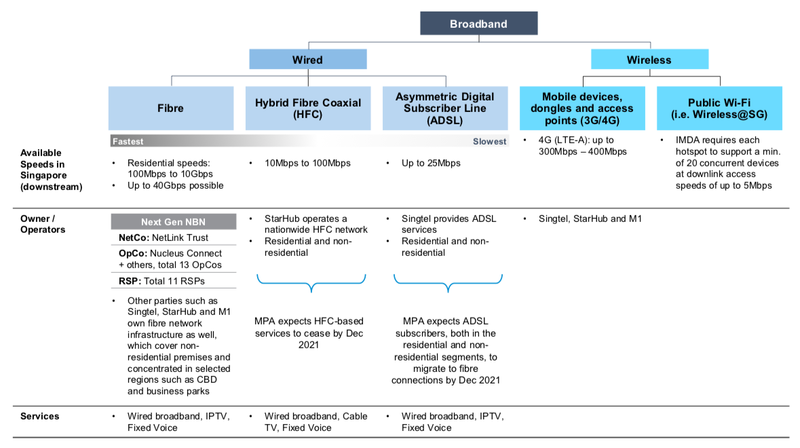 The switch from ADSL and HFC to fibre-based networks should lead to higher residential end-user connections. Population growth: As the COPIF 2013 requires an optical fibre termination point to be pre-installed in each new home, new BTO launches pave the way for organic growth in the number of end-user connections. In addition, Netlink is targeting to expand its network coverage to upcoming townships such as the new Tengah estate. The first batch of 1,500 HDB in the estate will be launched in November this year and it is expected to house a total of 42,000 new units by the end of two decades. Furthermore, it is announced that 2,000 more BTO flats will be launched next year with shorter waiting times. I believe the greater supply of new accommodation will provide a boost to the number of residential end-user connections. Launch of TPG Telecom in second half of 2018: Netlink stands to reap benefits through the provision of new NBAP connections for TPG's mobile network deployment. 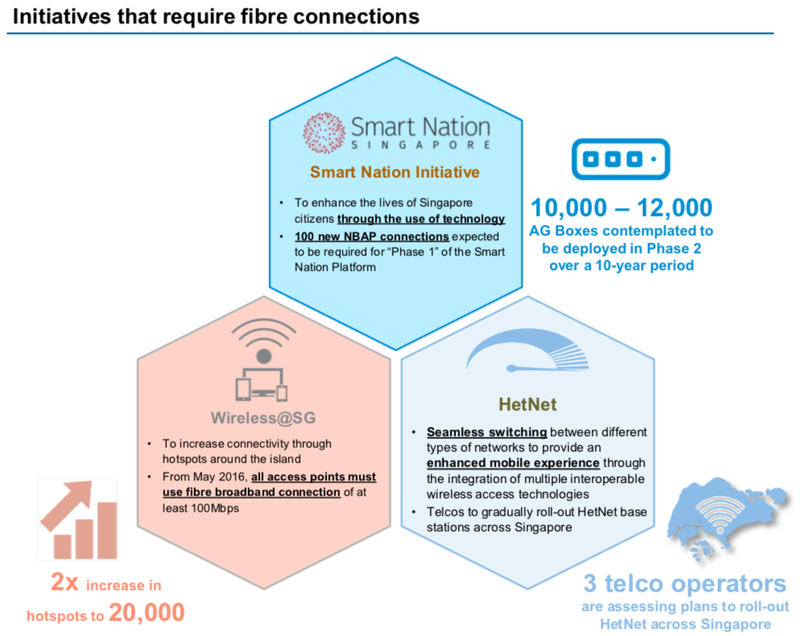 Smart Nation Programme: The demand for NBAP services is expected to grow with the roll-out of Singapore's Smart Nation Programme. This includes initiatives such as the installation of surveillance cameras at HDB blocks and carparks and autonomous vehicles. HetNet base stations: Heterogeneous Network which allows users to switch seamlessly between cellular and WiFi networks, was first rolled out by M1 in 2016. Other RSP are also assessing plans to roll out HetNet across Singapore after trial participation in the Jurong Lake District. Netlink is expected to provide the necessary fibre network infrastructure for the initiative. Wireless@SG: Singaporeans should be pretty familiar with the Singapore's public wifi hotspot initiative ("Wireless@SG") which was launched in 2006. IMDA is on track to double its network of hotspots to 20,000 by 2018 which can reach more locations, even hawker centres! Netlink is expected to support the deployment of next phase of Wireless@SG with fibre broadband connection for the access points. Unlike REITs which are required to pay out at least 90% of their taxable income to the unitholders in order to enjoy tax exemption, business trusts are not required to distribute dividends. In spite of that, Netlink NBN Trust has a distribution policy in place. Basically, it is a two-tiers system due to the business trust structure. Netlink will distribute at least 90% of its distributable income to Netlink NBN Trust, after setting aside reserves for future capital expenditure, working capital, debt repayment, etc. 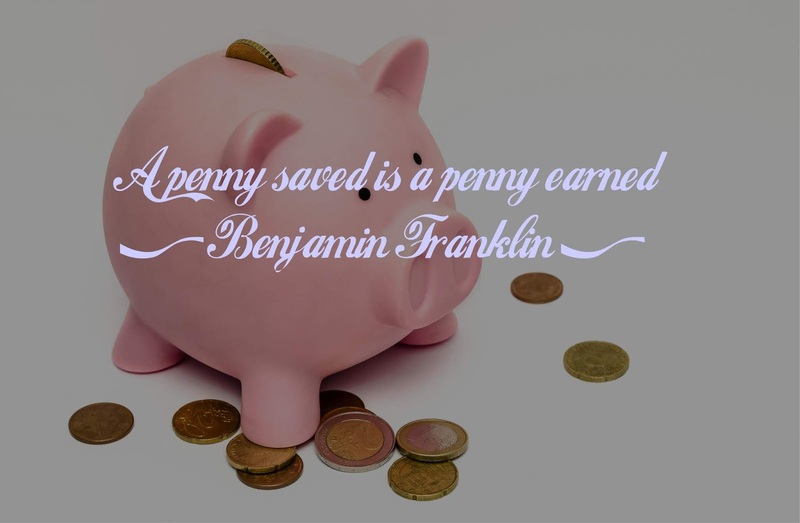 Subsequently, Netlink NBN Trust will distribute 100% of its available cash to the unitholders after paying for the Trust-related expenses and fees, etc. At my entry price, the distribution yield is calculated to be 5.72% based on FP2018 forecast. 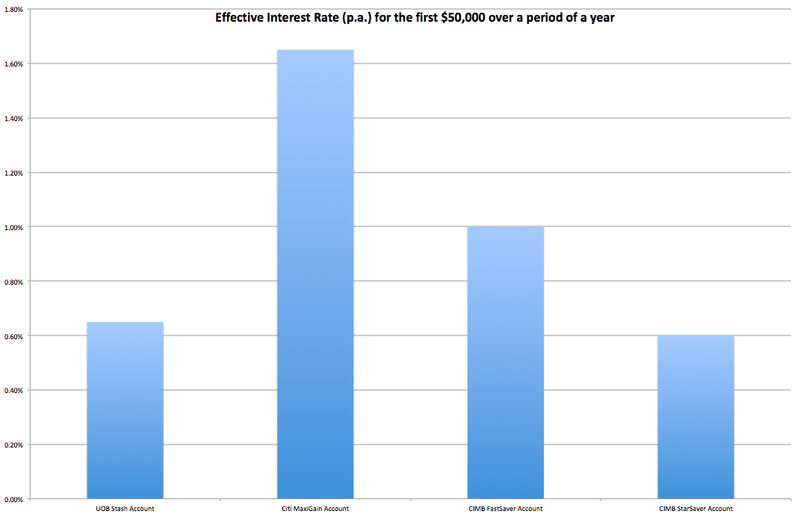 If the 5.5% projected growth is included, the yield should increase to 6.04%. As such, I believe it is reasonable to expect a distribution yield within this range. Meeting minimum QoS standards: Due to the tightly regulated industry, Netlink is required to meet certain Quality of Services ("QoS") guideline with respect to its provision of connection services. 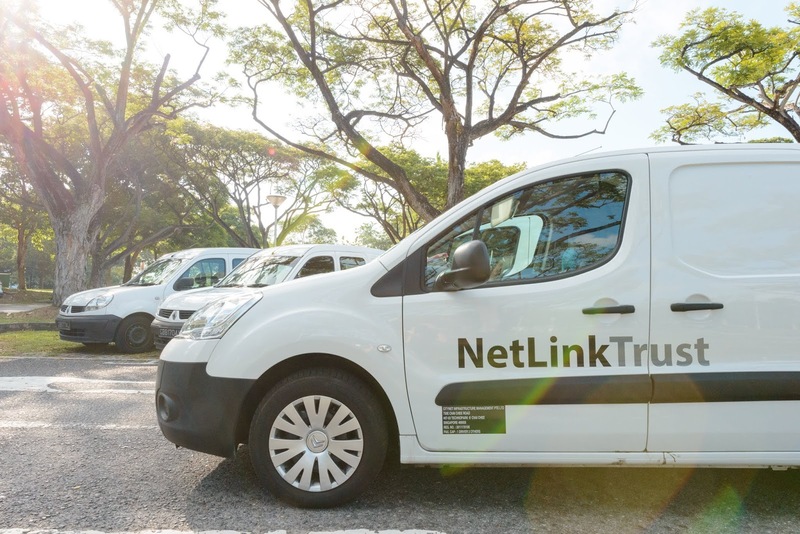 As a matter of fact, Netlink has been fined 6 times in 5 years for failing to deliver orders to home and business broadband users within the stipulated timeframe. These fines add up to a total of $2.14 million. While meeting a certain quality standards is part and parcel of operating in a regulated environment, it appears that Netlink faces difficulty in complying which inevitably amplified its business expense through the imposition of fines. Concentration/Geographical Risk: As Netlink is principally engaged in providing fibre-related services in Singapore, it faces a certain degree of geographical and concentration risk to rely on a niche market in a single country. Technological Obsolescence / Substitution Risk: Singtel's ADSL service was first launched in 1997 and was completely shut down in 2018. Starhub's HFC network has been an important part of Singapore's early broadband development since 2003 and Starhub has ceased its further rollout in 2018 as well. Having launched in 2007, the fibre broadband has been around in Singapore for a decade and is definitely not something new. With greater data consumption and our growing hunger for higher speed Internet access, it may seem inevitable that wired broadband will be displaced in future. Some of the potential substitution threats have their sources from (1) wireless broadband and (2) unlimited mobile data plans. (1) With the proliferation of wireless broadband, it raises questions on whether this will reduce the relevancy of fibre technology in future. Netlink has since cited some of the drawbacks of wireless broadband such as limited speed, higher network latency and inability to match the reliability and coverage of wired broadband. (2) These days, telco operators are rolling out unlimited mobile data plans which offers the possibility for light users to ditch their home broaband plans. However, telco operators usually throttle the surfing speed of their mobile subscribers once their local data usage exceed a certain threshold. Therefore, with the reasons stated above, I am not too concerned with the possibility of technological obsolescence at this stage. In my humble opinion, I would think that fibre broadband will not be easily displaced as a stable means of high speed data transmission in the near term. I must admit that I am buying into its growth story, the monopolistic advantage that Netlink has in the residential segment and its extensive nationwide network that forms a natural barrier to entry for other potential entrants. In this current technological era, the Internet has become embedded in every aspect of our day-to-day lives. Building on the demand for high-speed Internet access, Netlink has grown to be a resilient business in the defensive sector. In view of the rising interest rate environment, Netlink has also minimised the interest rate risk on 86% of its borrowing through hedging with fixed interest rate till maturity. This will sit nicely among the dividend play on my portfolio, with an anticipated distribution yield of between 5.72% to 6.04%.